The modern, complex industrialized states of the West are faced with multi-faceted challenges with regard to their overall national security, especially since 9/11 2001 and the following terrorist attacks in Europe: international terrorism, organized crime, drugs- and human trafficking, political and economic conflict. 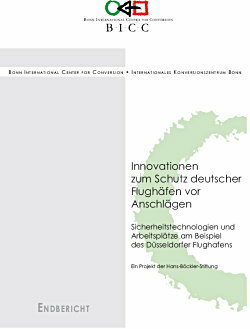 This study exemplifies both the threats and the technological chances for reducing these threats by examining airports, which doubtlessly represent particularly vulnerable security zones which is also due to their economic importance, as is exemplified by Düsseldorf international airport, one of the most modern ones in Germany. With nearly 18 million passengers in 2007, it is the third largest in the country. Its above average growth of 7.5 percent in passenger numbers in total and of 17 percent in intercontinental traffic, it is developing into an international traffic hub.